A conglomeration would be an understatement to describe christopher marlowe’s chloroform dreams. This play is closer to a mix and match. Like if you decided to take a simple t-shirt, add a fancy blazer, throw on a pair of khaki shorts, and top it off with a Converse and a backwards cap. It may look crazy, but on the right person in the right environment, it kinda works. Luckily, the person is Lunar Energy Productions, a group of theater artists no stranger to reimagining. christopher marlowe’s chloroform dreams, written with precision by Katharine Sherman, takes the title character and thrusts him in a noir world that of Philip Marlowe. Marlowe is on a mission to save his dame, Daphne, from the sinister Frizer and her own demons. Though the play starts off a bit slow and erratic in dialogue, once the intrigue and mystery unfolds, our interest rises. We begin with a moment of chloroform, as the title promises, and we are seemingly flashbacked to the past. The first act follows Marlowe on his journey, via his own narraration. 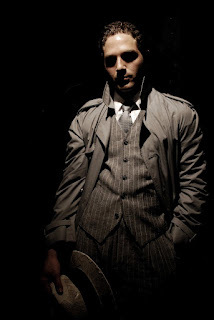 As the title character, Christopher Fahmie exudes the perfect amount of noir sexiness. He has the voice that is just right for noir. Though some of his dialogue was lost through his silky baritone, when he spoke, the story was moving. Michael Markham’s Frizer was quite engaging. Oddly, his character started off on the softer side, but once his dastardly ways were brought to light, Markham’s Frizer played like a Southern Fried Bond Villain. The scenes where Marlowe and Frizer have a power struggle via the phone were some of the most engaging moments of the piece. On the contrary, Marlowe’s love interest, Daphne, was not as slick. Valerie Redd’s interpretation of Daphne left a lot to be desired. The character appears to follow the basic guidelines of the stock ingénue with a bit of a twist. Redd was a tad weak and lost. Perhaps a stronger ingénue type would have a better choice. In Act II when the narration switched to Daphne, the play seemed to stop, not necessarily due to the script but by Redd’s Daphne. Curry Whitmire and Sheila Joon, who both played an assortment of noir-inspired characters, were light and frothy when needed and creepy and mystifying the remainder of the time. Joon’s Eleanor was an integral character, though I either seemed to miss her objective and justification for her actions or they were hidden too deeply. Overall, the ensemble was a joy to watch possibly because when they weren’t in the scene, they strategically shifting the scenery. Philip Gates’s staging was like clockwork. Scene shifts can tend to be gruesome, but not here. Every move was cleverly thought out. Gates and Scenic Designer Joshua David Bishop used the space miraculously. You enter the Red Room and ask yourself where’s the set. Fret not, like the mystery of the play, it’s hidden deep inside every nook and cranny. With Gates’s delicate direction combined with Sherman’s precise script, it’s clear that the writer/director combo has a clear dialogue between one another. Kalere Payton’s grayscale costumes evoked the right atmosphere. Her design for Marlowe’s costume, specifically the hat and the shirt, were brilliant. If you took a close look, you could see the detail of sentences on both items. On a larger budget, perhaps more his costume could have included this unique touch. The real joy to the design of the play was Alana Jacoby’s impeccable lighting. The space is limited, but the use of lighting spot on. The shadows she was able to create was exactly what a noir inspired play yearned for. The only real moment within the piece that lost me was the Spring Awakening-esque chorography. And the act break which was not necessary. For all you noir lovers looking for something out of the ordinary, christopher marlowe’s chloroform dreams is probably for you. You’ll stay engaged from start to finish and wish your life was a Elizabethean Noir fairytale.